Brooklyn Museum Wedding Photography taken in the evening holds a certain enchantment that one does not find in the daylight. This is a result of the dramatic lighting that adds romance and mystique to the space when the sun goes down. 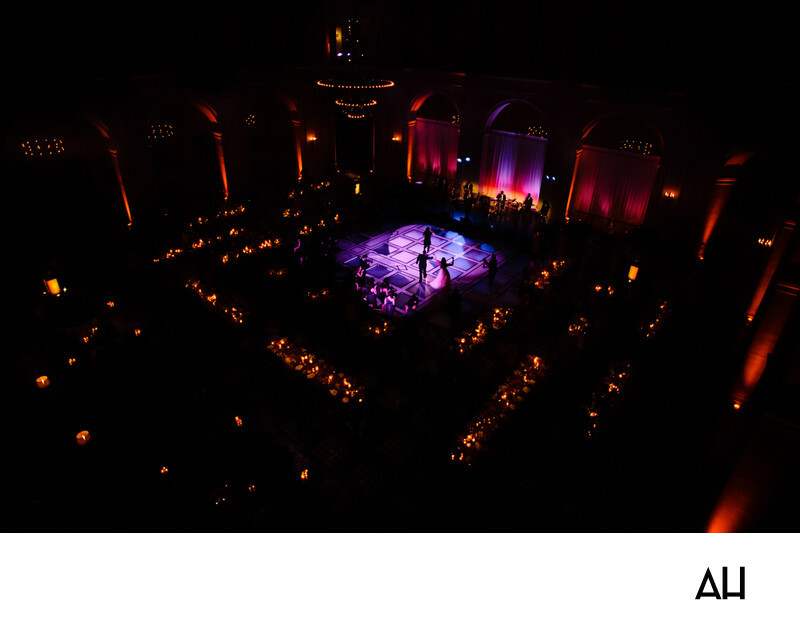 This picture captures a captivating scene such as this from a Brooklyn Museum wedding, located in the the glory of the venue’s Beaux-Arts Court. The Beaux-Arts Court is an exquisite location for any event, but especially for a wedding reception and for Brooklyn Museum Wedding Photography. The room measures 10,000 square feet and is covered by a vintage glass tile floor that was originally completed in 1927, but has since been updated. The walls of the space reach up two stories high, culminating in a skylight that washes the room in the glow of the sun during the day. The Beaux-Arts Court also boasts historic features such as original archways and a large brass chandelier that looms gracefully above the room’s dance floor during a wedding. This photo shows the magnificence of the glass floor, with purple and blue spotlights dancing over its tiles. The bride and groom are also spinning about the tiled dance floor, sharing their first dance as a husband and wife as the band plays their favorite song. The room is dark save for the colored spotlights that shine over the bride and groom, and the scattered lanterns, candles, and a few wall lights. The lighting of the space gives the court a truly magical ambiance that is added to by the two violinists that play right on the dance floor with the couple. The evening was full of surprises, and guests sat in constant wonder as they gazed at the love before them and the beauty that surrounded them.